Planetary Herbals Calm Child™ is a special blend of the soothing botanicals chamomile, lemon balm and catnip with the nourishing tonifiers hawthorn, jujube, gotu kola extract and amla. These are combined with additional supporting herbs and nutrients to support calm, focused attention in children. ** Also available as a great tasting liquid. The Whisker Comfort™ is designed to eliminate whisker stress (also called whisker fatigue) when your cat is eating. Whisker stress happens when a cat's ultra sensitive whiskers are constantly touching the sides of the bowl. This can result in a lack of interest in food, finicky eating habits and irritability. The bowl features a gently curving surface so the cat's whiskers never come in contact with the bowl's sides. 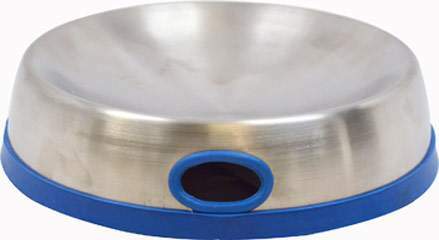 The curved surface also ensures that food settles to the bowl's center and does not get pushed into the edge of the bowl and abandoned. Easy to clean, bacteria resistant, stainless steel construction Medical grade silicone non-skid edging (removable for easy cleaning). A cushioned finger hole for easy lifting. No Artificial Flavor or Sweetener, No Preservatives, No Sugar, No Starch, No Milk, No Lactose, No Soy, No Gluten, No Wheat, No Yeast. Taking care of your eyes has always been important, but as technology—and screens—become more and more a part of our daily lives, we're challenging our eyes like never before. No Artificial Color, Flavor or Sweetener, No Preservatives, No Sugar, No Starch, No Milk, No Lactose, No Gluten, No Wheat, No Yeast, No Fish, Sodium Free.